Today we review the Naturally Playful Adventure Lodge by Step2. This complete playset includes clubhouses, swings and a slide to entertain your children endlessly. We know how difficult it is to keep kids entertained these days, and to convince them to step outside. Technology is addictive and kids are falling prey and younger and younger ages to the trappings of computers and video games. While these activities offer learning opportunities and acquisition of certain skill sets, nothing compares to good old-fashioned fresh air and exercise. 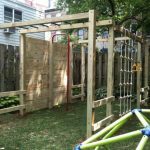 Multi-player playsets offer several activities to encourage building of strength and use of imagination. This set includes: two stories of climbing and hiding play space; sturdy ladder steps and ¾ climbing wall with hanging climbing rope ladder leading to upper level; fun steering wheel; large 6’ slide. It also includes two strap swings, a two-person glider and a backboard hoop for ball toss (ball not included). This giant swing set functions as a playhouse, climber and jungle gym all in one! With multiple play areas, there is something for everyone, with all kinds of fun to spark their imaginations and keep them active. The slide will keep them busy going up one side and coming down the other; they can play castle in the clubhouse; they can swing and toss a ball into the included hoop for competitive games. The maximum weight is 75 pounds per swing. This particular set is recommended for children 3-8 years of age. Glider weight capacity is 100 pounds. Designed for variety, stability and maintenance-free fun, it uses double-wall poly construction to eliminate common swing set problems. Essentially this is a large climber with a rustic lodge theme, with earth tone finish. Its primary material is plastic, which, unlike metal, stays cool in the hot summer sun, so you don’t have to worry about your kids burning themselves! Some assembly is required. The set arrives in two large boxes. Ground anchors (they are U-shaped) are included to secure this set to the ground. Impressively this set is manufactured in the United States of America. It comes with all hardware; you just need the tools (standard tools like drill, screwdrivers and hammer). We recommend laying out all pieces with according hardware before you begin assembly. This will save a ton of time during assembly process by checking that all parts are present. This will also help you line up the pieces as you go. It’s all in the preparation! Assembly will take at least half a day with two people, which includes sorting everything, building and then inspecting to make sure all connections are tight. Overall product weight: 392 lbs. Also consider the basketball area when assembling. You will need to leave a good amount of space for that, as well as the slide. Altogether you’re looking at about 50 by 30 feet space including play set and sufficient surrounding area. It is absolutely essential to place this on level ground. If your yard is hilly, you will have to level it. Otherwise the parts won’t line up properly and you will experience frustration and difficulty assembling the play set. The instructions rely heavily on visuals so make sure to pay close attention. This set, due to its clever design, has a good centre of gravity since it is quite long and not too tall. It holds up well to winds and winter weather, but it must be resting on a flat surface. While the plastic holds up to all weather conditions, you will want to bring in the glider and swings during winter in order to protect them. This plastic kit is trustworthy and durable, offering endless possibilities of entertainment for the kids while needing little to no maintenance from the parents. Best of all, it can be taken apart and moved to a different home should you move house. It will provide good fun for kids aged three to eight years old. After eight they will likely outgrow the play set, especially the club houses. This play set is good for parents or anyone running a home daycare! Best of all, the plastic parts will not cause harm to the kids. Wooden sets will fade, splinter and warp, but not this plastic set! It is highly durable and can stay outside year round. All in all this is a very reasonably priced and sized swing set that will grow with your toddlers. The Naturally Playful Adventure Lodge play center swing set by Step2 sells for around $1000.